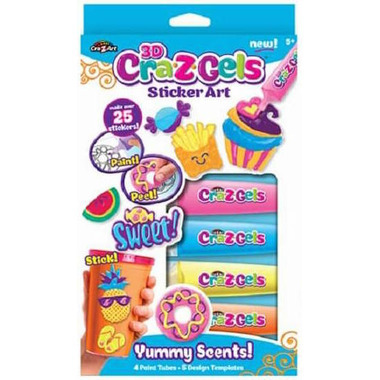 3D Cra-Z-Gels Liquid Graffiti is a line of 3D sticker art sets. Create cool dimensional stickers using our special 3D gel paint. It is easy and super fun to do! After the stickers dry, stick and re-stick them anywhere! Great to decorate notebooks, lockers, cell phones, picture frames, mirrors and more! Make over 25 stickers. Paint! Peel! Stick!